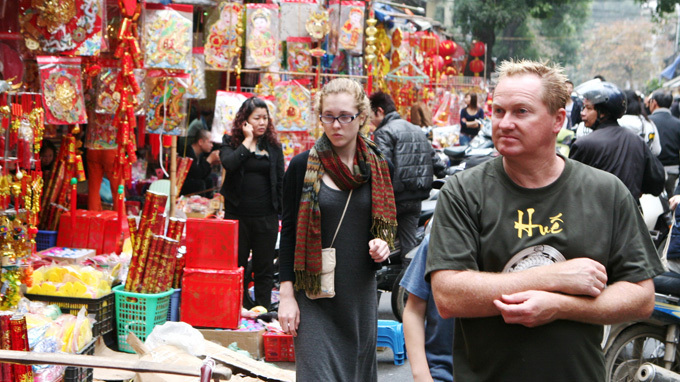 In this file photo foreigners are seen in an area of Hanoi where items for Tet (lunar New Year) are sold. The Government has issued a new decree providing for the granting of work permits for foreign laborers to work in Vietnam and the deportation of foreigners who work in Vietnam without a work permit. >> Foreigners must have work permit before arriving in VN: bill According to Decree No. 102/2013/ND-CP dated September 5, 2013, foreigners who want to be granted a work permit are required to meet the five following conditions. First, they must have enough civil capability according to Vietnamese laws; second, they must be in a health condition suitable for the jobs they want to do; third, they must be mangers, managing directors or technical workers; fourth, they must not be offenders or those who are held criminally responsible under Vietnam’s or foreign countries’ laws; and fifth, they must obtain written approval of a State agency in charge of employment of foreigners. Employers of foreigners in Vietnam must, every year, and during the year if there is any change, be responsible for reporting their demand and seek approval for using foreigners for each specific position where Vietnamese nationals cannot meet the employer’s requirements. Such reports shall be made to the People’s Committee of the province/city where the company’s head office is located. Prior to this employers must recruit Vietnamese labor, if, after two months, the position is still not filled, they can look for overseas candidates. Job offers must declare clearly the requirements of a position that the local workforce cannot support. Companies need to have approval from the chairman of their respective province to recruit overseas employees. The Decree also covers people exempted from work permits, including people with a master’s degrees or higher; who are teaching or researching at universities or vocational colleges for less than 30 days; students studying and working in Vietnam; and volunteers who working in Vietnam under international treaties. However, regarding foreigners who offer services in Vietnam, if the offering period is longer than three months, they must have a work permit. Each work permit is now valid a maximum of two years (currently it is three) and will be withdrawn upon expiration. If a business needs to use a foreign worker continuously, the business must apply for the reissuance of work permit for this person. The suggestion for reissuance should be submitted five to 15 days before the expiration of the work permit to the Ministry of Labor, War Invalids and Social Affairs where the work permit was granted. Except for cases in which foreign laborers are exempted from work permits, as set out in Article 7 of the Decree, any foreign employees in Vietnam who do not have a work permit will be deported. Accordingly, the Department of Labor, War Invalids and Social Affairs in provinces/cities where foreigners are working without a work permit will propose that local police expel them. The proposal for expulsion shall be made within 15 days after the date when the department identifies illegal foreign laborers. The new Decree will take effect on November 1, 2013 and replaces Decree No. 34/2008/ND-CP dated March 25, 2008 and Decree No. 46/2011/ND-CP dated June 17, 2011 on employment and administration of foreigners working in Vietnam.